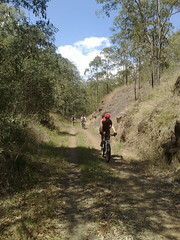 Here’s some pictures of our ride on the Moore-Linville-Benarkin section of the Brisbane Valley Rail Trail yesterday. It took us a couple of hours to get up the mountain on the old railway line, and about 30 minutes to ride down the highway, racing off the cars and trucks. The salad roll I had in the Benarkin Store was the best I’ve ever had. I can’t beleive how hungry I got after two hours riding. 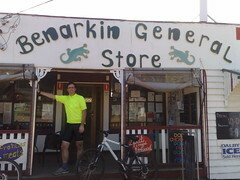 Benarkin is the highest point on the ride. 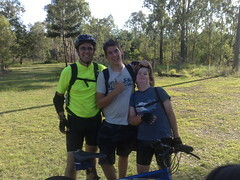 We had the option of riding another 5km down into Blackbutt and back, but decided against it. Steve B did really well on the ride. His seat wasn’t adjusted properly, so partway through the ride he was pretty sore and ended up having to stand on his pedals quite frequently to get some relief. To his credit he persevered. Harrison did well too. Even though the climb was gradual, it was unrelenting. After a couple of hours, looking up the line at another kilometre of long slow hill climb can be quite depressing. He kept riding which is what counts. The other thing that made the ride hard work is that we came across lots of locked gates. So we had to lift the bikes over the gates, and climb over. And then there’s the ravines. When Qld Rail ripped up the rails, they also took out the bridges. So instead of rolling over bridges, we had to ride down steep gullies and up the other side. 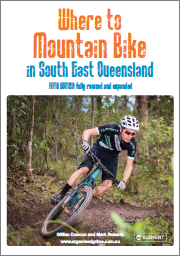 It’s fun – what Mountain Bikes are made for. 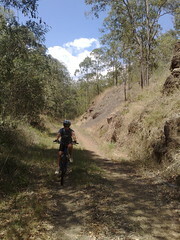 We had to be careful riding down and push like crazy to pedal out of the ravine. If we didn’t keep our momentum up we’d end up having to walk the bike out of the gully which is harder than pedalling out. At the top, we decided we didn’t want to battle the deep gullies and locked gates again, so we rode the hghway down. In some places the highway is pretty steep and we found ourselves keeping pace with the cars. It’s exciting, but there’s no room for mistakes. Luckily we made it without any incidents. 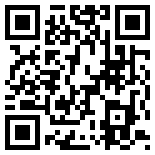 As usual on long rides, the battery on my N95 mobile phone / gps ran out. So I’m very thankful to Steve G for giving me a copy of the GPS data from his Garmin so I could share the map below.